The ideal addition to Photo rope Sweetheart 1,5 m (magnets are not identical) - especially when you lost those magnets or they are not enough. 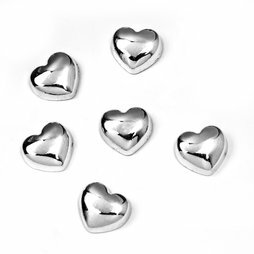 The silver-coloured hearts are perfect for attaching especially valuable items - family photos, love letters or concert tickets of your favourite band. There is a strong neodymium magnet on the backside of the metal hearts. The heart magnets will be delivered in a decorative transparent box and are arranged on a metal strip so they won't shift during shipping.